The final report for the Routes to the River Project was just released and is available for download in the library (link to the right). The next task for this project is working with PDOT on the implementation phase. When Fritjof Capra (physicist, philosopher, and the author of The Tao of Physics) last spoke in Portland, he talked about the findings of a thought experiment he and his colleagues researched. This thought experiment ranked which human activities pose the greatest ecological impact to our planet. Based on Capra’s findings, having a child causes the greatest impact, followed by eating meat and driving. For many people, these are tough activities to avoid. Capra’s advice: Strive to minimize participation in one of these activities. Capra claims to drive a first generation Prius, has two daughters, but is a vegetarian. I, on the other hand, have a two children and am a full fledge meat eater. (In college, I experimented with vegetarianism to no avail.) So according to Capra’s ideology, if I want to save the world I need to drive less. Fortunately, I live in the Buckman neighborhood where walking and biking can meet most of my daily transportation needs. Buckman and its surrounding neighborhoods, are close to downtown; have good mass transit service; and include great schools, restaurants, entertainment options, coffee shops, grocery stores, hardware stores, second hand stores, retail, not to mention a vital bar scene. Currently, a couple efforts are being made to improve pedestrian and bicycle access throughout the Buckman neighborhood. Buckman Community Association chair, Susan Lindsay and I recently participated in the Routes to the River stakeholder’s workgroup lead by PDC and its team of consultants. In a nutshell, Routes to the River was a promise made by the City to the Eastside neighborhood during the planning of the Eastbank Esplanade, to provide better connectivity from the neighborhoods to the River. A final draft of recommendations that were developed during the stakeholder workgroup sessions is due out in early September. In addition, I am currently working with the Kerns Neighborhood, HAND, the Bicycle Transportation Alliance, and the PDOT to designate SE 9th Avenue (or other near by north/south Avenue) as a bicycle boulevard. Bicycle boulevards are low traffic streets that are designed to encourage bicyclists and discourage thru motorized vehicle traffic. SE Ankeny and Clinton streets are good examples of two existing bicycle boulevards. The boards from Buckman, Kerns, and HAND have all recently made motions to support this effort. Next up – contacting the Central Eastside Industrial District (CEID) regarding this proposal. Lone Fir Cemetery Benefit Concert! The Doug Fir Lounge at 8th & East Burnside is sponsoring a benefit concert for Lone Fir Cemetery on October 24th with new songs and music being performed specific to the ancestors residing here. Tickets are now available, please see www.dougfirlounge.com for more information. Building on its visionary urban design legacy, the City of Portland is taking the lead on sustainable, equitable and economically viable long-range planning. 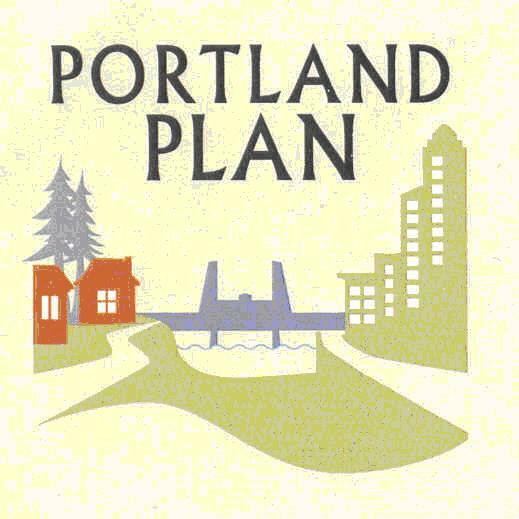 Over the next three years, the Bureau of Planning will be updating its 1980 Comprehensive Plan and the 1988 Central City Plan in an effort called the Portland Plan. The Portland Plan is a guide to the physical, economic, social, cultural and environmental development of Portland over the next 30 years. The plan will build on the work the community did through VisionPDX, which captured our shared values of sustainability, equity and accessibility, and community connectedness. This plan will form the type of neighborhood Buckman will be in the future. Therefore it is important for our residents and associations to review these plans and influence the goals, policies, and implementation actions. 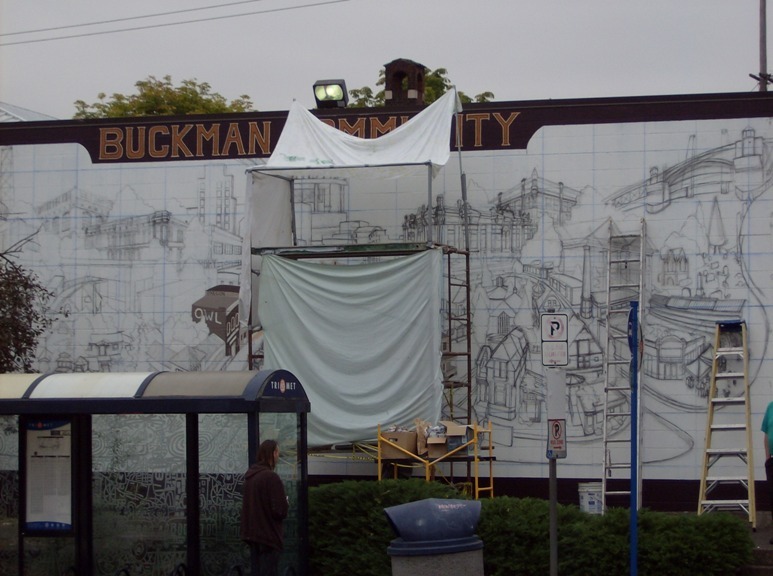 Issues that Buckman has identified to date include: the appearance, scale, and type of new development, Washington / Monroe community center and swimming pool as a major capital improvement, creating more equity among Portland citizens through economic development, and creating more livable and sustainable communities. But given the fact that Buckman is likely to grow by several thousand people over the next twenty years we don’t want development to change our neighborhood character for the worse. Work has been underway for about nine months. The next public review period will be September through November of this year. More information is available on the Portland Plan website. At this site you can get e-mail updates of future activities as well as read about the previous reports and information. The three renderings to the left are the results of discussions held during the meetings. They were displayed at the Open House at Lone Fir Cemetery. None of these will be the final plan, but a combination of these elements along with other ideas will form the final design. The Buckman Community Association has discussed the development designs at Lone Fir Cemetery twice and the Buckman Historic District Committee reviewed at their August meeting. While Buckman has a thirty year interest in the development of the Morrison/Belmont/20th intersection as a small commercial node, the BCA has taken the position that the general character of the preliminary designs is acceptable. The BCA will continue to review the developments and are well represented on the METRO Lone Fir Cemetery work group by Susan Lindsay and Don MacGillivray. Unfortunately funds are not available for these improvements, but with the significance of this historic cemetery it is believed that resources will be found from a variety of sources. More information will follow later this year. For more information contact METRO’s project manager Janet Bebb, at 503.797.1710 or online at www.oregonmetro.gov/cemeteries. 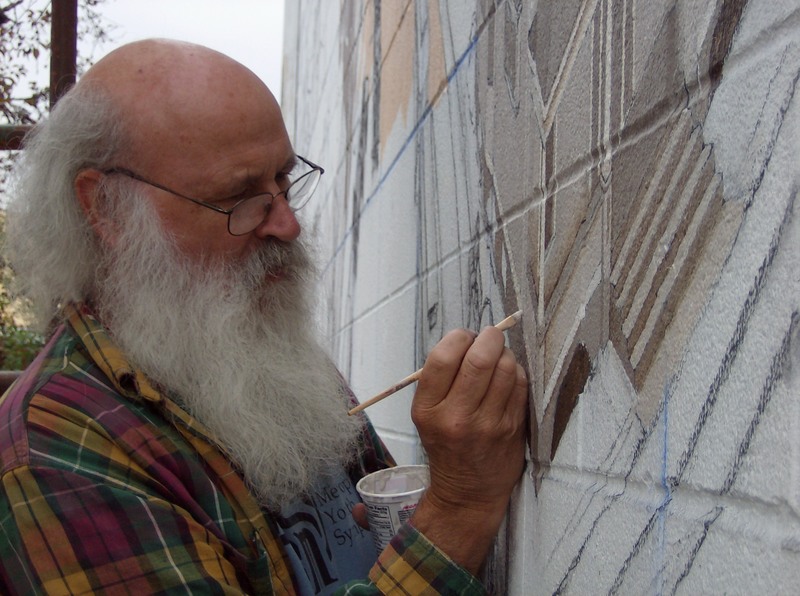 Buckman, in response to the current interest in sustainability locally and nationally, is offering an opportunity to meet and discuss options that interested residents can use to improve their lives and help society achieve a more livable future. We meet at Buckman school at 7 pm on the second Tuesday of each month. We wish to accomplish several things: 1st. give people a more informed idea of what sustainability is all about and some of the options available locally; 2nd. Allow like minded people to find each other and work on projects with help the neighborhood as well as themselves; and 3rd. 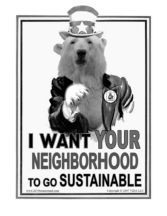 make people more aware to local resources, plans, events, and people that involve sustainability. Other neighborhoods in southeast are creating similar committees which are coordinated through SE Uplift. We are in close contact with Portland’s Office of Sustainability which has resources available to as including a wonderful website. If this interests you and you are available on a Tuesday evening, drop by and say hello. You are currently browsing the Buckman Voice blog archives for September, 2008.